Laurence J. McEvoy has been a practicing attorney in San Jose since 1970 when he began his career as a litigation associate with the firm Campbell, Custer, Warburton and Britton. He formed an association of attorneys in the mid-80’s and has been a principal of the firm since its incorporation in 1987. Over his career Mr. McEvoy’s practice has emphasized real estate and commercial law, civil litigation, estate and trust litigation, representation of debtors and creditors in bankruptcy, and family law. He continues to represent individuals and companies in business and personal matters, planning and protection of legal rights. San Jose Magazine named Mr. McEvoy as one of Silicon Valley’s Top Lawyers five years running. 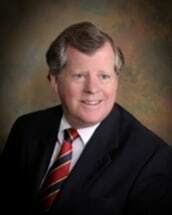 Mr. McEvoy is a graduate of Santa Clara University, having received his Juris Doctorate in 1969 and his Bachelor of Arts, Political Science, in 1966. Mr. McEvoy is admitted to practice in all of the courts of the state of California, the United States Court of Appeals for the Ninth Circuit, and the United States District Courts for the Northern, Eastern, Southern and Central Districts of California.